A treasure trove filled with fascinating anecdotes about the tiny ripples that have caused big waves in history, Hitler’s Secret Jewish Psychic will cure you of two misconceptions, the first being that history is relentlessly boring and the second that significant historical events are caused by significant and great causes. Here you’ll unearth a multitude of facts you never knew were true. You’ll learn some unbelievable things about some of the most prominent figures in history (e.g., Picasso was stillborn until his uncle revived him by blowing cigar smoke in his face!). You’ll discover facts about some of the most famous wars in history (the Japanese actually manufactured balloons carrying deadly diseases, which they attempted to send over the Pacific Ocean to the United States). Other strange facts include: The career Fidel Castro almost chose over his leadership of Cuba; Where Eli Whitney got the idea for his invention of the cotton gin; What almost happened during the Wright brothers’ first successful flight; Why certain literary works almost never saw the light of publication; What day should have really been designated Independence Day; The truth behind Winston Churchill’s daring escape from a Boer War POW camp; Franklin Roosevelt’s campaign cover-up; The behind-the-scenes beliefs of Isaac Newton; and many more! Tons of curious history. Published at $19.95, our price only $14.95! 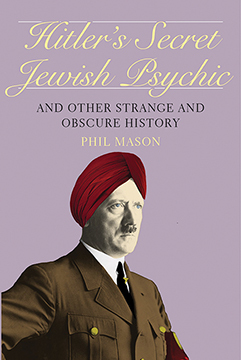 HITLER’S SECRET JEWISH PSYCHIC: And Other Strange and Obscure History By Phil Mason. 416 Pages. 6x9 Paperback.